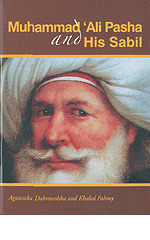 Muhammad Ali Pasha and His Sabil "Soft Cover"
A colorful account of the life of one of Egypt’s most charismatic rulers and of the public water dispenser he built in memory of his son. Muhammad Ali Pasha, who ruled Egypt from 1805 to 1848, was a dynamic and far-sighted leader and is credited by many with the modernization of the country. When his son Tusun died of plague in 1816, the grief-stricken father commemorated him with a sabil (a public cistern and water dispenser) of an architectural and decorative style entirely new to Egypt. The sabil fell into disuse and disrepair in the twentieth century, but after a painstaking conservation program lasting six years it is once again an architectural jewel, now open to the public. This guide to the spectacular and important sabil in the heart of historic Cairo explains why and how it was constructed, how it was used, and how it changed over time. It also tells the story of the extraordinary life and fascinating personality of the founder of the building, Muhammad ‘Ali Pasha. Written by the architect who directed the long conservation project and by a historian who is a leading authority on Muhammad ‘Ali and his times, this account introduces the general reader to a unique building and offers an insight into events in a crucial period in Egypt’s history. The book is illustrated with many photographs, diagrams, historical engravings, and reproductions of unpublished documents and letters.